This is my take on the Apple reveal today. I was not there live, instead I watched it via live bloggers and video from various sources. 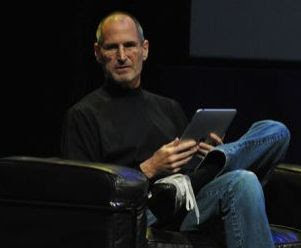 Steve Jobs, et al, showed off their new "not-quite-a-tablet" computing device: The iPad. Yes. Let that soak in a moment (no pun intended). Does it look kinda familiar? It should. It's basically a big iPod Touch with some "bonus features" thrown in. See the "home key" on the right? Just like it's little brother. One new feature is pop-down/pop-out menus, which make getting to settings inside apps easier. The screen size (9.7 inches) provides for a nice viewing area, considering there are no frills with which to be distracted. The unit comes with a microphone, speakers, WiFi, Bluetooth, and standard 30-pin apple connector. For $150 more than the asking price, one can also add 3G cellular surfing from AT&T ($14.99/250 MB per month or $29.99 for unlimited - no contracts). One of the cool things about it was the embedded video within an article. Talk about marrying technologies. EA did a demo of "Need for Speed: Shift," but frankly, it was like watching any other demo. Nothing jaw-dropping there so far as I could tell. The interface sports a qwerty keyboard that fills about half the screen, but as you can see, the keys are HUGE for such a little screen. The presenters talked about iTunes, YouTube, Facebook, etc. They also showed off their version of eReader: iBooks. Now, THAT looked cool. 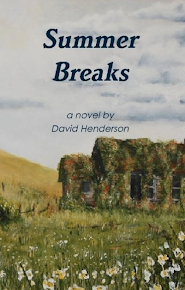 It actually looks like you are holding a book, with "pages" and even the illusion of a cover. The iBookstore works like iTunes, so it will be easy for folks to pick up on that. So, how much is this over-sized iPod Touch? 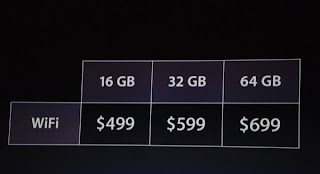 As I said, add $150 in each category for the 3G access. The real question is whether or not people are going to buy this thing. I already have an iPod Touch, and while the prospect of having a much bigger screen is nice, I can't see running out to buy one. It has NO usb ports and NO memory card reader. Some people are complaining that it has no camera. Maybe not, but I don't really see that as a huge drawback, considering what it is being used for. Though, a user-facing camera would be nice for conferencing, I suppose. It turns out there may be a device (here) that will add an SD slot and USB to the iPad, so who knows. I am hoping to convince my boss we need one to demo/try out. I think it is worth looking at, especially for education use. Of course, schools could buy twice as many 8GB iTouches for the money as they could iPads, so I'm not sure it's worth it even then. it is not a netbook! 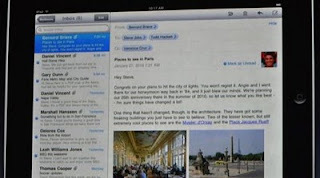 3G models (assume with AT&T, of course) "Two awesome plans for iPad owners. The first one gives you 250MB of data a month for $14.99. We have an unlimited plan for just $29.99 a month." No contract, prepaid. 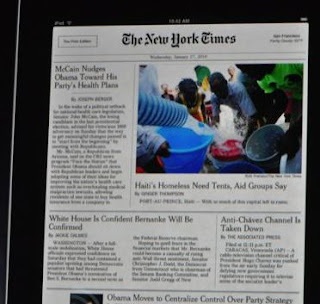 NY Times Newspaper layout actually looks like newspaper and has embedded video. It's a big iPod Touch. If I have one, is there really compelling reason to buy this? should have been called iSlate. Apple likes one-syllable names after the i. Nice Dave. This is the first I have read since I was sequestered in curriculum meetings all day. I think I like the name iPad better than iSlate. I am not sure if I am going to run out to buy one especially since we have no wireless in my school district. One thing about education, the book company they have behind them is a heavy hitter and I think this would be great for college students who want one pad instead of a book bag full of text books. Great review Dave. I think iPad will be better in the classroom than iPod Touch because it has iWorks and a larger screen to read. I do worry about the lack of USB or memory card reader. If students could get text books on this thing it would really have wide appeal. I think they designed it with education in mind. I don't really like the name but maybe it will grow on me. If it runs the iPhone/iTouch applications, then Calibre and Stanza will be your path to placing eBooks (and PDFs) on the device. I will be curious to see how this develops. What do I do while watching football? At Any Time and Place - School on a snow day!? Dinosaurs and Rockets - and a cool T-Shirt!